All-You-Can-Eat Pumpkin Day fast is approaching and we've got a long yummy night ahead, but don't get too caught up filling your cheeks and bellies. It will soon be time to start foraging for the best holiday deals. 2. Make a List: Shopping for the MVP's in your life can get overwhelming. Streamline the process with quick & easy To-Do list, better yet pick up a Squirrel Stuff Magnetic Shopping List Notepad, and be confidant that your found the perfect gift for all your favorite nature-loving nuts! Ah, the great outdoors... c'mon, every body Think Outside! Fun. Relaxed. Comfortable. Premium organic & pure cotton nature-inspired t-shirts direct dyed & garment dyed for every body. Available in ladies cute & mens' size. Perfect for staying tidy while digging small holes and sorting nuts. Available in Green and Blue, one size fits all! Not everyone was born with bushy tail to keep them warm. 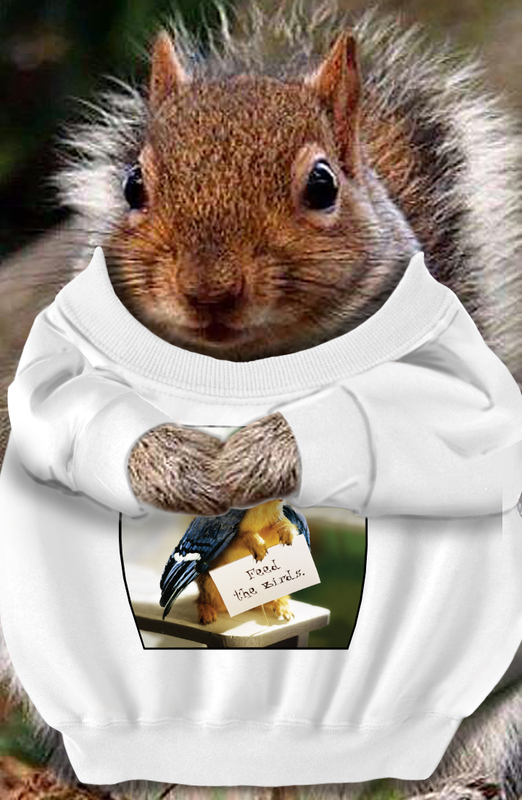 Layer up with funny squirrel sweatshirts. Provides just the right amount of insulation and they feel as good as they look. Squirrel Stuff garden flags are perfect for creating landmarks and for buried nuts and mapping out the squirrel friendly bird feeders around the neighborhood. You can even order flag stands. Helpful all year round and they're perfect for keep track of your hidden nuts. It's important to begin each morning with a hot cup of coffee before a long day of foraging, jumping, leaping, and stock piling your holiday stash. Set the table with the perfect conversation starters and be the hit of every backyard shindig. Available individually or in 4 packs and create-your-own set of 4. The raccoons did the math, the 4 packs are the better deal. Acorns bounce off these like the new Sky Cafe Tray bounces on concrete. These are are paws-down the greatest t-shirts of all time! Remember fellow squirrels, don't drop nuts on anyone wearing them. Stuff your stockings with the funniest squirrel gifts ever! Looking for a $5 tee, the perfect economical Birthday present, a one-of-a-kind birdwatcher Christmas stocking stuffer, or that "OMG, Where did you find that?" just-for-fun gift at a budget friendly discount price? Congratulations, you found it! The Squirrel Stuff team is always busy thinking up the next groundbreaking squirrelly idea and updating or upgrading our materials, and that means there is always a sale!The products change over the year and once they're gone, they're gone. So be sure to add this page to your favorites and check back regularly for updates. You never know what goodies you'll find! “too squirrel-proof” & “attracts too many cardinals”. Just look at this stakeout footage, its the dead of winter and they’re all over the place. A feeder the only feeds birds, Ha! Seriously, what were those Arundale designers thinking? The easiest way to track fresh sales is to Like us on Facebook and check the Close-Out Sale! page for updates. There's a different sale every week, don’t let the savings scamper by! Squirrel Stuff offers FREE Shipping on all retail orders $30 or more in the continental U.S. All replacement Sky Cafe Hopper & Trays automatically receive Free Shipping. There are also exclusive online shipping specials available to Wholesale customers with approved online accounts, sign up today!